Welcome. I am so happy you stopped by. We are having beautiful Spring weather - a little cool with beautiful blue skies - the weather has been perfect for our early blooming White Iceberg Roses. They almost grow wild here in Southern California and usually bloom until November. What have you been up to? I have been relaxing and taking a blog break to enjoy Spring, paint and plant flowers. 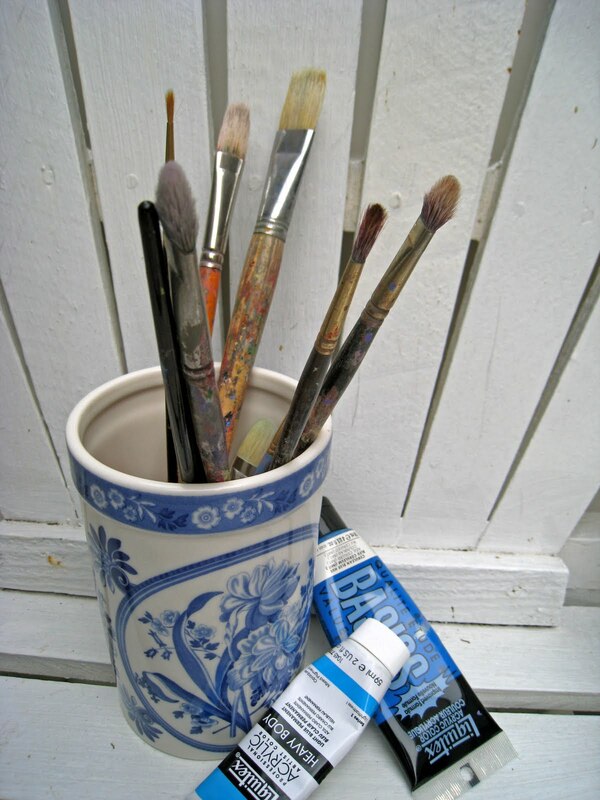 Would you like to take a little relaxing tea break with me and I will share some blue and white inspiration with you? Bentley is already in the garden and wanted to show you his blue and white rug where he likes to curl up and nap in the sun. The first of the white and pink Iceberg roses. I collect blue and white china and love shopping for special pieces at flea markets and tag sales. Every room in my home has some blue and white. My painting aprons are, of course, blue and white. Paint brushes are stored in a blue and white vase. Blue has become my signature in my art and most of my larger paintings have a piece of blue and white as part of the still life. The beautiful Spring blue sky is a perfect backdrop for the first blooming climbing white roses. The Iceberg roses bushes are covered with blooms. The beautiful white roses were just irresistible and the inspiration for a quick little painting. I paired the roses with blue silk hydrangeas since the hydrangeas will not be in bloom for a a few more months. Thank you for stopping by. I love hearing from you and sincerely appreciate your visits, comments and those who are following my blog. If you have any questions or would like to see me paint something special, please leave me a comment or send me and e-mail. Love your blue and white. So crisp and pretty! Hi Bentley. Oh Erin, I just love that painting! I'm not a blue type person, but I always sigh when I see it somewhere else!!! Hope you have a lovely weekend, our weather is finally warmer after so much cold which is strange for here! So, I'll be venturing outside soon!! Love your spring inspirations Erin...beautiful painting. Hydrangeas are a favorite of mine as well. I love that painting Erin! Is it for sale? 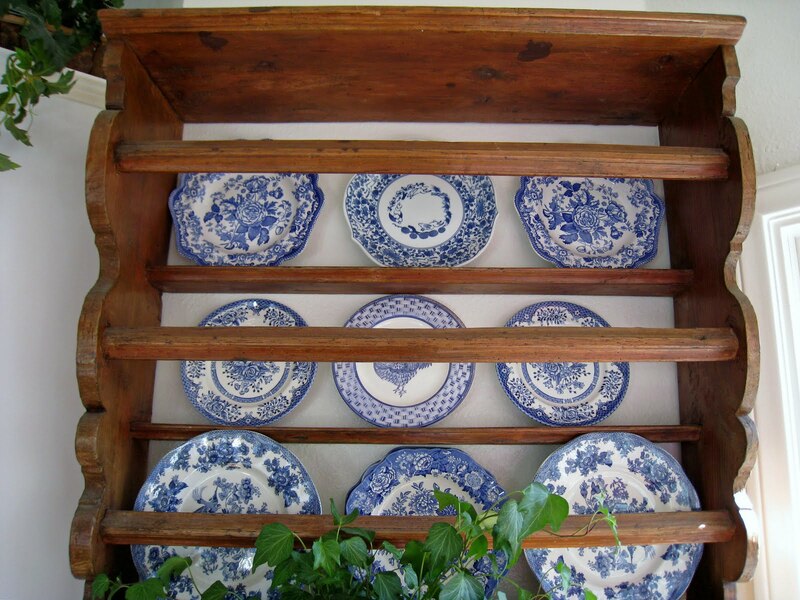 And the plate rack with the blue is to die for!!!!!!!! As soon as I saw you blog title I knew I would love this post since I love blue and white too! Your latest painting is fabulous. I love the combination of the roses and hydrangeas. Those roses growing in your garden are so dleicate looking. Beautiful painting, Erin. And I love all your blue and white, so pretty! Bentley is just the sweetest. Well first of all I would like to tell you that you have inspired me to take painting classes. So my hubby and I started one this last week. I also love looking at all your pictures of your garden as we are just starting to put in our yard! Beautiful. I love blue and white. Everything is so pretty here. Love the blue and white. Your painting is lovely. Beautiful and cozy. Dreaming of something like this myself.